SRI LANKA RAILWAYS (Sri Lankan) Locally Manufactured ‘Jayanthi’ Class locomotive. Build in shunting purpose in 1956 in Ratmalana Railway Workshop under guidance of cheif engineer Mr. Raj Gopal. 2 engines (180hp x 2) taken from Class S1 (imported in 1938, phasing out of service after 1955) was used for this locomotive. Maiden journey on 05th of September 1956. Declaired open by Maithreepala Senanayaka, Minister of Transportation, 1956 government. Locomotive is non operational and scrapped. When 590 engine was manufactured in Rathmalana same numbered loco was manufactured in Canada (first engine of M2a batch). So M2a was renumbered as 591 which was named after Canadian provincial name “Manitoba”. 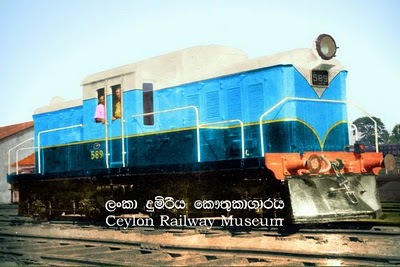 Image courtesy Sri Lanka Railway Museum.